The Big Red Looks to push Michigan in the Legends Division. Optimism about the offense begins with quarterback Taylor Martinez, a fourth-year starter. He has been risk-reward throughout his career, however. Last season, for example, he set school records with 3,890 yards of total offense and 33 touchdowns passing and rushing. His passing yardage and TD passes were both the third-most in Husker history, and he was only the fourth Nebraska quarterback to rush for 1,000 yards in a season. On the negative side, he was turnover-prone, losing 8-of-16 fumbles and throwing 12 interceptions. Ameer Abdullah was technically the No. 2 tailback but stepped up when the departed Rex Burkhead battled a knee injury, starting seven games and rushing for 1,137 yards and eight touchdowns. Imani Cross, the only other experienced I-back, is trying to prove that he’s more than a third-down back. The top three receivers return: Kenny Bell, Quincy Enunwa and Jamal Turner. But Jake Long is the only experienced tight end, a position at which the Huskers have traditionally been solid. The line again is built around first-team All-Big Ten and second-team All-America guard Spencer Long, an aggressive run-blocker, as well as three veteran tackles. Coach Bo Pelini is spending more time with the defense, his area of expertise, a change that began a year ago. In addition, the defensive staff has a year’s worth experience working with second-year coordinator John Papuchis. Line coach Rick Kaczenski and secondary coach Terry Joseph were new last season; linebackers coach Ross Els was new the year before. There’s experience and depth in the secondary. Cornerbacks Ciante Evans, Andrew Green, Josh Mitchell and Stanley Jean-Baptiste all have been starters. In contrast, the defensive line has only two players with significant experience — end Jason Ankrah and tackle Thad Randle, who battled injuries last season. The plan is to utilize several players up front, some of whom could play both inside and outside. The starting linebackers are new, with Zaire Anderson, a former junior college transfer who started one game in 2012 before undergoing knee surgery, and David Santos leading the way. True freshman Courtney Love might make an immediate impact. Taylor Martinez, QB – Has a Nebraska-record 39 starts at quarterback and ranks eighth all-time in rushing with 2,858 yards and 31 rushing TDs. Ameer Abdullah, IB – Rushed for 1,137 yards and eight TDs, earning coaches’ second-team All-Big Ten honors. Kenny Bell, WR – Second-team All-Big Ten pick caught 50 passes for 863 yards and eight touchdowns. Kicking hasn’t been a concern under for Nebraska under Pelini, with Alex Henery for three seasons and then Brett Maher the last two seasons. Mauro Bondi backed up Maher two seasons ago then redshirted in 2012. Unlike Maher or Henery, Bondi was a scholarship recruit, with an impressive résumé out of high school. He has kicked only one extra point at Nebraska, however, so he’s an unknown quantity. Henery and Maher punted as well, and Bondi could follow them. But redshirt freshman walk-on Sam Foltz appears to have the edge there. The loss of long-snapper P.J. Mangieri also is significant. Entering his sixth season at Nebraska, Pelini has gotten the program back on track, winning at least nine games in each of his five seasons and playing for a conference title three times. But the Huskers have yet to win a conference championship, and they’ve lost their last three bowls. The offense is championship caliber and is directed by a veteran quarterback. The main concern is the development of a line with two new starters. And the defense is inexperienced everywhere except at cornerback, and a question mark coming off a season in which it allowed a staggering 214 points and 2,380 yards in four losses. The schedule sets up well, with eight home games and no Ohio State or Wisconsin in Big Ten interdivisional play. 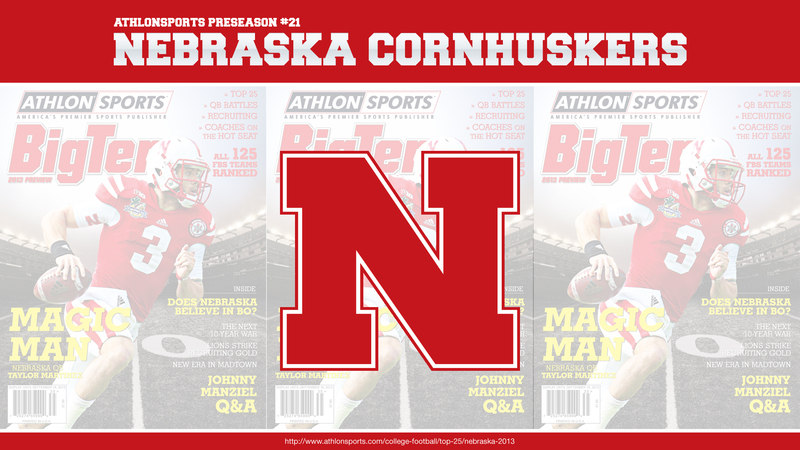 The Huskers could well be 8–0 going to Michigan in early November. Which College Football Conference Has the Best Quarterbacks in 2013?